The soon-to-be new owner of Hummer said the company will try to make the gas-guzzler adapt to the times. "Tengzhong has been aware of the importance of energy-efficient vehicles," said Yang Yi, CEO of Tengzhong Heavy Industrial Machinery Co, in an exclusive interview with China Daily. Tengzhong signed a previously announced deal with General Motors (GM) on Friday in Detroit to purchase Hummer, a deal Yang says is likely to get Chinese government approval this year or early next year. "A series of fuel-efficient vehicles including electric and renewable fuel models have already been under development. And environmentally-friendly products will be introduced to the market soon," said Yang, who was in Detroit to sign the deal. The Sichuan-based company will attempt to parry the unfavorable gas-guzzling image of Hummer and cultivate markets outside the United States. "If Tengzhong adheres to the strategy of developing greener Hummer vehicles, there will be a bright future for the business," said Jia Xinguang, chief analyst with the Chinese National Automotive Industry Consulting and Development Corp.
Hummer's daunting gas tanks could be a challenge to Beijing's efforts to foster energy-efficient consumption. Earlier this year, the Chinese government halved the purchase tax on cars with 1.6-liter or smaller engines to encourage sales of small vehicles. The deal also needs to be approved by the US government. If the deal goes through, Tengzhong would be the first Chinese company to purchase a famed Western auto brand. The Ministry of Commerce said on Saturday it has not yet received an application about Tengzhong's bid for Hummer. The size of the deal was not revealed, but the Associated Press said it was $150 million, citing an unnamed source. Yang said Hummer's production would remain in the US and GM would provide key components and assembly services over transitional period. 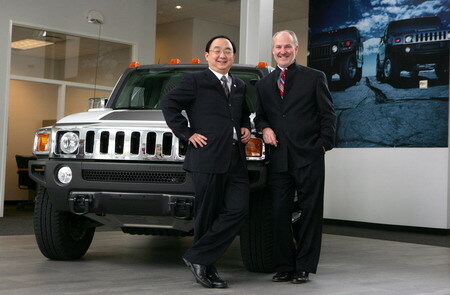 Tengzhong plans to maintain Hummer's headquarters in Detroit and retain existing senior management and operational team. Some analysts doubt whether the deal itself is worthwhile. "The labor cost of Hummer's 3,000 employees who have been kept according to the deal is much higher than in China. Tengzhong, with an annual output of 3 billion yuan ($440 million), can hardly afford such a burden," said Ma Guangyuan, a public policy researcher with the Chinese Academy of Social Sciences. "The deal does not include Hummer's core technology needed to make the vehicles," Ma said. Yang shrugged off concerns that Tengzhong, a long-time manufacturer of heavy machinery equipment such as road and bridge components and construction and energy industry equipment, lacks the experience in the automobile business. "We have already made several automobile-related acquisitions prior to the deal, and plan to focus more on the high-end sport-utility vehicles." According to Yang, Tengzhong will devote marketing efforts to areas outside the US where year-on-year sales of Hummer plunged 64 percent from January to September. "There is market demand for all terrain vehicles like Hummer in places with complex landscapes such as southwest China, and there are rich people who can afford it," said automotive analyst Jia.